When he was 12 years old, Dr Hooman Baghaie’s family left their comfortable, middle-class life in Iran behind. This decision by his parents was made out of love and sacrifice: as members of a religious minority, they had experienced discrimination and persecution. The last slight was when their eldest son was denied entry to a college for gifted children after his father, Zia, had volunteered to the school’s administration that the family were followers of the Bahá’í faith. Suddenly, Hooman’s academic gifts were seen in a different light. There was no place for Hooman there, his parents were told, despite his excellent results on the entry exam. Nor was there a place in Iran for the Baghaie family, who had tired of this persecution. They knew there would only be more hurdles for their bright children in Iran, and they knew that other Bahá’ís had been jailed because of their religious affiliations. The eldest son’s rejection mirrored an earlier disappointment experienced by his mother, Betsy, who was expelled from medical school in 1988 on the basis of her faith. Like mother, like son. Yet it was in thumbing through her copy of Gray’s Anatomy that the seed for Hooman’s career was planted. 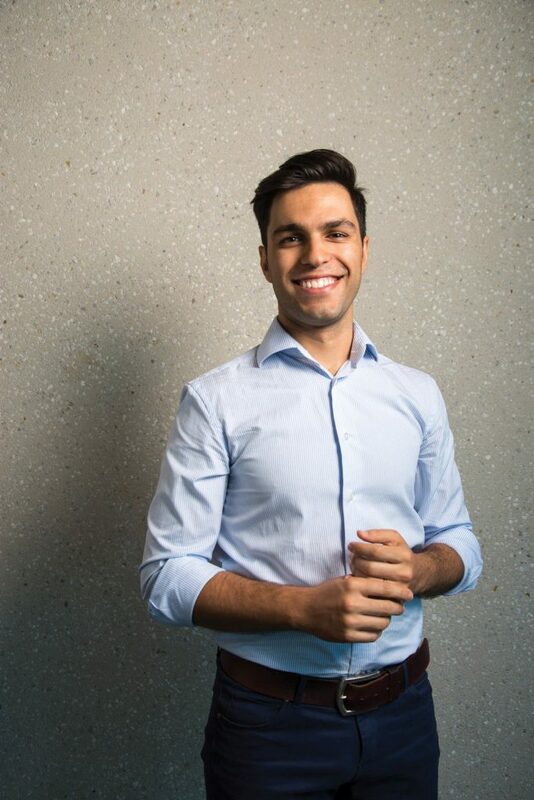 Within a decade, the Iranian-born refugee would be safe and secure in Australia while immersed in studying oral health, and later dentistry, while on a path to fulfil the inclusive, community-minded spirit on which his faith was based. The family’s path to Australia was not simple or easy. They left behind two houses, two cars and his father’s well-established career in refrigeration engineering. The five of them—Zia, Betsy, Hooman and his two younger sisters, Helya and Hasti—spent nine months in limbo at an apartment in Kayseri, Turkey. They were asylum seekers, and on arrival, Zia went to the United Nations office to explain their situation. After carefully reviewing their case and confirming the truth of their allegations, the Baghaie family were awarded humanitarian visas to Australia, since Betsy had family members who lived in Geelong. Now 26 and living on the Gold Coast, Hooman Baghaie tells this story over cups of Persian tea and a plate of walnut biscuits. He lives in a high-rise apartment building in Southport that overlooks the ocean, and each morning, his bedroom is lit by a spectacular sunrise. Two days per week, he works as a dentist at a small clinic in Helensvale; during the remaining weekdays, he attends nearby Griffith University while studying his first year of a degree in medicine. His interest in the oral cavity has widened since he completed a Bachelor of Oral Health at the University of Melbourne in 2011, then moved north to dedicate himself to a Bachelor of Dental Science, which he completed in 2016 as a valedictorian at the University of Queensland. After medicine, he plans to specialise in maxillofacial surgery. Newly married in 2017, Hooman shares the Southport apartment with his wife, Maya, who works as a nutritionist. The pair share their Bahá’í faith and are devoted to fulfilling its tenet of improving the lives of others: she by advising people on their diet, and he by tending to their oral health needs. Theirs is a service-oriented partnership that looks outward, and asks: how can we help? Dentistry did not appeal from a young age. He enjoyed science and maths at high school, but working on the human mouth seemed icky, to say the least. It was a fortuitous placement at a private dental clinic as a teenager that changed his perception. He saw how the dentists distanced themselves from the oral cavity through layers of protective equipment, and he saw how skilfully they worked with their hands. He saw how precisely dental procedures were planned and performed, and he was glad that he had followed his father’s suggestion to try the placement, despite his reservations. If he didn’t like it, Zia said, he didn’t have to go back. But he did like it, and that week-long informal placement at the clinic owned by a family friend became the basis for his career aspirations. Once he got his head around the English language, school became a breeze. He finished his secondary education at the end of Year 11, aged 17, having undergone an advanced study program. In a secular society, Hooman Baghaie excelled, as his parents had always suspected he would. “With all of that, it taught me to grow up really fast, and become self-reliant very quickly,” says Hooman Baghaie. He was heavily invested in competitive soccer throughout his adolescence, but after discussing with his parents, he decided to put his on-field talents aside in order to focus on his senior schooling. A career in health care was far more dependable than chancing it as a professional soccer player. It wasn’t all schoolwork. Hooman fondly recalls playing his fair share of computer games such as Grand Theft Auto: Vice City, like many of his schoolmates. But his maturity beyond his years is evident in the fact that he did not rebel against the serious, studious path before him. Instead, he embraced it. “It just made sense to me,” he says with a shrug. “Video games will always be there.” He gestures at the couch in the living room and points out there’s no television in front of it, nor an internet connection. Instead, home is a place for Hooman and Maya to spend time together, free from distractions. While studying at UQ’s dental school, Hooman volunteered with the Royal Flying Doctor Service’s outback oral health program, and also travelled to Cambodia and East Timor to provide much-needed dental expertise in communities where oral health and hygiene are lacking. The University of Queensland funded these trips, and these experiences only solidified Hooman’s devotion to helping others—not just through treating symptoms, but by empowering the underprivileged through preventative measures such as education. In Melbourne, his father now runs a small air-conditioning company, while his mother oversees a family day-care business. They were overjoyed that their eldest son was a valedictorian on graduating with a Bachelor of Dental Science last year. His outstanding achievements offer living proof that their enormous sacrifices, made out of love, were not made in vain. In the Baghaie family, it is clear that Iran’s loss was Australia’s resounding gain.